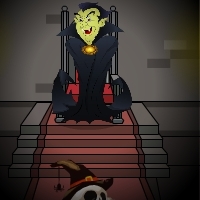 GenieFunGames - GFG Genie Vampire House Escape is another point and click game developed by Genie Fun Games. Imagine that you have been trapped in vampire house. He is going to do something dangerous to you. He may comeback at any time you have to find a way to trap and destroy him. Do it very quickly you don't have much time. It's not easy but you can Find useful objects, stuffs and puzzles. Think and solve everything in the game and then escape. Good luck and have fun!